Sage grouse are the largest of the North American grouse species. The throat is black with a white collar; yellow-orange eyebrow. Spike-like tail feathers are fanned out in the mating ritual. Immature birds and females have mottled brown throat and breast. These birds blend in well with Nevada’s muted landscape. Found in foothills, plains and mountain slopes where sagebrush is present, or in mixture of sagebrush, meadows, and aspen in close proximity. This sagebrush obligate species eats the brush and uses it for nesting under as well as general shelter and cover. They build their concealed nests in depressions on the ground under sagebrush. Sage Grouse is the most common grouse species in Nevada and is found throughout the west. They are found in fifteen of Nevada’s 17 counties. Ranging from central Washington, southern Idaho, Montana, and parts of southern Canada and Great Plains, south to eastern California, south-central Nevada, southern Utah, western Colorado and northern New Mexico. Male makes a bubbling pop-pop sound as air is released from air sacs during courtship ritual. Clucks like a chicken when flushed. Sage grouse feed on sagebrush during winter, and during other times of year, also feed on leaves, blossoms, and buds of associated plants. They also eat insects like ants and grasshoppers. 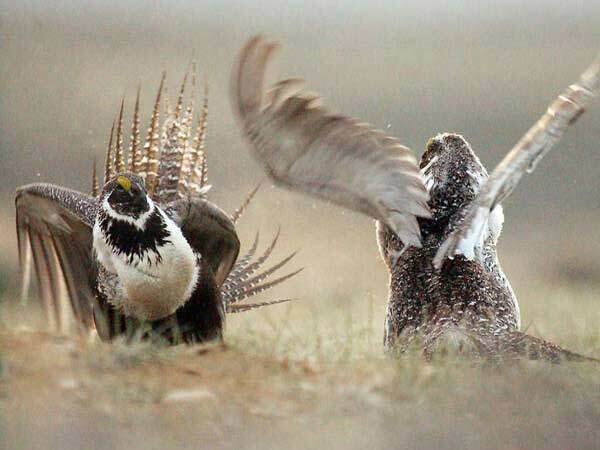 During the breeding or strutting ritual, male sage grouse puff out their bright yellow throat sacs which are bordered with white feathers, flare their sharply pointed tail feathers and strut in an impressive display around the lek in an attempt to woo a female mate. The sage grouse continue their strutting on and off for an hour or two after the warm sun moves over the mountains and onto the lek, then it‚Äôs on with the day as usual, though occasionally sage grouse have been found strutting at other times of the day or night. The breeding season typically begins in mid March and lasts through mid-May. Because of the number of birds that congregate in one area, leks are generally the best areas to get the most accurate head counts of sage grouse. The number of birds that show up varies from lek to lek ‚Äì some leks may draw only two sage male grouse, while others may draw 250. Adult sage grouse often return to the same leks year after year, vying for the dominant position. Female incubates 7-8 eggs (sometimes 7-15), for 25-27 days. Young are precocial and downy, are tended by female, and fly when they are 7-14 days old. The males fight to establish territory. The dominant males usually win the largest central area of the lek for their strutting territory. There are usually a few guards for the dominant male, and they have the rest of the central territory. Yearlings and males that are not as healthy are usually pushed to the edges of the strutting grounds. The male sage grouse will strut at the leks from March to early June. The females arrive later, usually during April to mid May. The hens usually stay at the leks for two to three days while they choose one of the males, then mate. About 90 per cent of the hens mate with the few dominant males. Then, they move out to the nearby sage flats to find a good nesting place. Sage grouse were historically very abundant across Nevada and the West. The greater (northern) sage grouse is the most common grouse species in Nevada and is found throughout the west. However, due to diminishing habitat of slow growing sagebrush due to development, fire, invasive weeds and other factors, an effort is being made to list the sage grouse as an endangered species. To help avoid such a listing, Nevada Governor Kenny Guinn appointed a team of approximately 25 people from diverse backgrounds and interests to his Sage Grouse Conservation Team in June of 2000. The mission of the team, as defined by Governor Guinn, is “To conserve and protect Nevada’s sage grouse and their habitat,” and as such, NDOW is working steadily to that end. While greater sage grouse still thrive in much of the species range in Nevada, the Conservation Team is attempting a pro-active strategy to find solutions to localized problems before the species truly reaches a threshold of vulnerability from which recovery might be difficult.